To centralize management across many different firewalls and remote access users, the Barracuda NextGen Control Center enables administrators to manage and configure security, content, traffic management, and network access policies from a single interface. Template-based configuration and globally available security objects enable efficient configuration across thousands of locations. The Barracuda NextGen Control Center helps significantly reduce the cost associated with security management while providing extra functionality both centrally and locally at the managed gateway. Software patches and version upgrades are centrally controlled from within the management console and deployment can be applied to all managed devices. Highly customizable administrative roles can be defined to delegate administrative capabilities for specific departments or locations. The Barracuda NextGen Control Center is offered at three levels - Standard Edition, Enterprise Edition, and Global Edition. All Barracuda NextGen Control Center levels enable administration of an unlimited number of Barracuda CloudGen Firewall platforms. The Standard Edition allows for a single configuration group. The Enterprise Edition allows for an unlimited number of configuration groups for a single enterprise / tenant or "range." The Global Edition is designed for service providers who service multiple tenants and allows for separate and secluded configuration trees for each tenant. Security-conscious companies and managed security providers are confronted with an increasing number of gateways in their networks. Managing hundreds or thousands of systems can require a costly, time-intensive process by qualified staff. 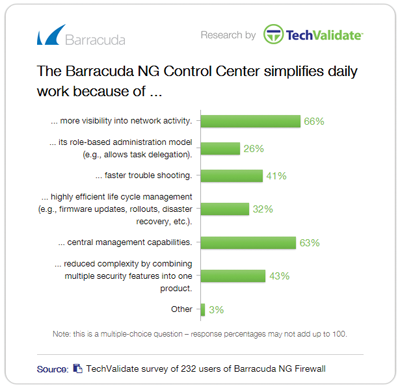 The Barracuda NextGen Control Center can significantly decrease administrative overhead. The Barracuda NextGen Control Center gives full control over system administration costs. 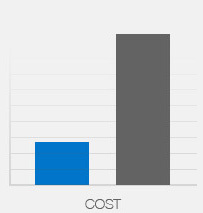 Lifecycle costs: Central update management drastically lowers the time spent deploying patches. Even Barracuda CloudGen Firewalls, with different software versions can be centrally managed at the same time. Deployment costs: Using the Barracuda NextGen Control Center, rollouts with hundreds of devices can be completed within a few weeks instead of months. Operating costs: The Barracuda NG Control Center helps to significantly reduce the cost associated with security management while providing extra functionality both centrally and locally at the managed gateways. Firewall rulesets and other security policies, as well as, software patches and version upgrades are centrally controlled from within the management console. Deployment can be scheduled and applied to all managed devices. Highly customizable administrative roles allow delegation of administrative capabilities for specific departments or locations. Administrators are kept informed at all times on the status of remote gateways and can implement centrally defined security rules at every location. Furthermore, the integrated revision control system provides easy audits and cuts overhead. The Barracuda CloudGen Firewall gives administrators granular control over applications, allowing them to define rules for forwarding data traffic using the best respective transmission channels based on type of application, user, content, time of day, and geographical location. Mobile devices, online applications, social networks, and streaming media have caused an enormous increase in non-business network data traffic, pushing bandwidth capacities to their limits and causing degradation in performance of business-critical applications. The Barracuda CloudGen Firewall allows organizations to prioritize traffic by limiting or restricting access to non-business-related applications and network traffic, even when encrypted. Secure your organization's data against hackers, malware, DoS attacks, and botnets with Advanced Threat Detection. Traditionally, these threats would routinely bypass signature-based IPS and antivirus engines. Advanced Threat Detection stops threats in their tracks. You gain granular control backed by real-time, zero-hour threat intelligence, all from one single pane of glass that is easy to use and manage for the most advanced, up-to-the-minute security. One way to greatly increase the capacity of site-to-site links is to simply pay more for extra bandwidth. A better way is to take advantage of the Barracuda CloudGen Firewall's advanced WAN optimization and cloud-enablement capabilities. Cloud offerings like Amazon EC2 and Windows Azure depend on highly secure environments within the cloud. The Barracuda CloudGen Firewall is ideal for securing use of these cloud services - connecting on-premises networks to the cloud and connecting logically separated components within the cloud datacenters. The Barracuda CloudGen Firewall incorporates advanced site-to-site and client-to-site VPN capabilities, using both SSL and IPsec protocols to ensure remote users can easily and securely access network resources without time-consuming client configuration and management. The communication protocols used with our VPN clients has been optimized to be fully roaming-capable by quickly reconnecting upon loss of communication. Smart pathfinder technology determines the nearest point of entry to the corporate network. Advanced NAT traversal technology can use different encapsulation ports in either TCP or UDP and is able to mimic SSL to cut through intermittent proxies. Maintaining and trouble-shooting security devices within enterprise networks can take a lot of time and IT resources. To mitigate operational costs, the Barracuda CloudGen Firewall provides advanced trouble-shooting and analysis through the intuitive web interface so that information such as activity history, complete logs, and graphical accounting can be obtained from powerful drill down views with just one click. Problem resolution times can be reduced from hours to just minutes. With affordable, all-inclusive pricing (no per-feature or per-user license fees), the Barracuda CloudGen Firewall can converge multiple point solutions into just one appliance to deliver impressive upfront and running cost savings. Ease of use keeps training and administrative costs low, while traffic intelligence and WAN optimization extend the capacity of existing infrastructure to deliver additional long-term direct cost savings. As part of the Barracuda Energize Updates subscription, automatic signature updates are delivered on a regular schedule or on an emergency basis to ensure that the Barracuda CloudGen Firewall is constantly up-to-date. If the firewall unit is centrally managed, the pattern updates are conveniently distributed by the Barracuda NextGen Control Center. Barracuda NG Malware Protection shields the internal network from malicious content by scanning web content (HTTP and HTTPs), email (SMTP, POP3), and file transfers (FTP) via two fully integrated antivirus engines. Malware protection is based on regular signature updates as well as advanced heuristics to detect malware or other potentially unwanted programs even before signatures are available. Barracuda NG Malware Protection covers viruses, worms, trojans, malicious java applets, and programs using known exploits on PDF, picture and office documents, macro viruses, and many more, even when using stealth or morphing techniques for obfuscation. The Barracuda Network Access Client, when used with the Barracuda CloudGen Firewall, provides centrally managed Network Access Control (NAC) and an advanced personal firewall. This allows enforcement of minimum Windows client security prerequisites before being allowed access to the network or access to a quarantine network. Security posture can be specified according to available Windows patch level, availability of antivirus and/or anti-spyware, and user ID. Access restrictions are enforced locally on the client by the centrally managed personal Windows firewall as well as at the gateway. Using existing Barracuda CloudGen Firewall appliances, Barracuda Networks offers a ready-to-use Network Access Control framework without expensive investments into the basic network infrastructure. All Barracuda Network Access Clients as well as all Barracuda CloudGen Firewall units acting as policy servers can be administered, monitored, and reviewed from a single Barracuda NextGen Control Center. Managing the security issues in a widely distributed enterprise network can be painful and extremely time-consuming. Managing a system may take only 15 minutes per day. But having 20 firewall systems in place results in five hours per day - just to manage the existing system. With the Barracuda NextGen Control Center, managing mulitple Barracuda CloudGen Firewalls takes the same amount of time as managing one. 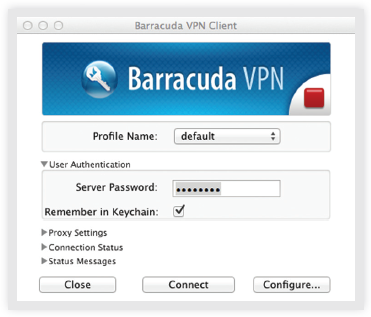 Barracuda’s Mobile Portal is an optional feature included with an “NG SSL VPN and NAC” subscription. By providing advanced attack and threat protection features such as stream segmentation and packet anomaly protection, TCP split handshake protection, IP and RPC defragmentation, FTP evasion protection, as well as URL and HTML decoding, Barracuda CloudGen Firewall is able to identify and block advanced evasion attempts and obfuscation techniques that are used by attackers to circumvent and trick traditional intrusion prevention systems. As part of the Barracuda Energize Updates subscription, automatic signature updates are delivered on a regular schedule or on an emergency basis to ensure that Barracuda CloudGen Firewall is constantly up-to-date. If the firewall unit is centrally managed, the pattern updates are conveniently distributed by the Barracuda NextGen Control Center. Barracuda NG Malware Protection shields the internal network from malicious content by scanning web content (HTTP and HTTPs), email (SMTP, POP3), and file transfers (FTP) via two fully integrated antivirus engines. Malware protection is based on regular signature updates as well as advanced heuristics to detect malware or other potentially unwanted programs even before signatures are available. Barracuda NG Malware Protection covers viruses, worms, trojans, malicious java applets, and programs using known exploits on PDF, pictures and office documents, macro viruses, and many more, even when using stealth or morphing techniques for obfuscation. 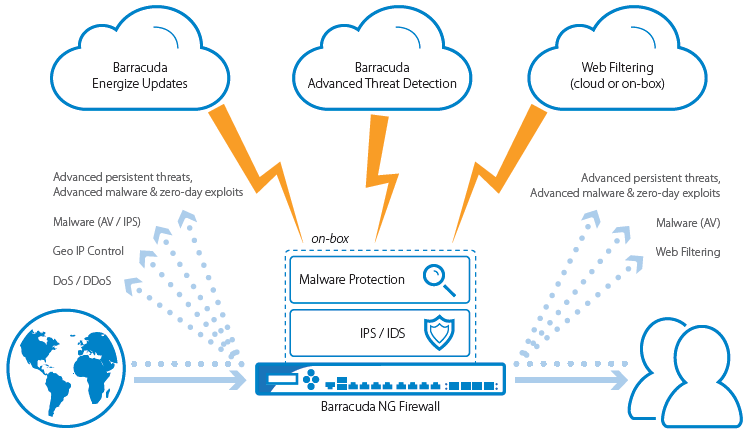 Barracuda Advanced Threat Detection (ATD) uses next-generation sandbox technology powered by full-system emulation to catch not only persistent threats and zero-day exploits, but also advanced malware designed to evade detection. Files are forwarded to a cloud-based sandbox environment, where they are executed and analyzed to identify suspicious and malicious behavior. Barracuda ensures flexible and simple deployment with your existing network infrastructure-no additional hardware is required since resource intensive sandboxing is offloaded to the cloud. The cloud database is continuously updated by all Barracuda CloudGen Firewalls with enabled ATD and, thereby, speed up the processing of already known files. The administrator has full policy control over how PDF documents, Microsoft Office Files, EXEs/MSIs/DLLs, Android APKs, compressed files and archives are emulated and delivered to the client. Based on identified malware activity, infected users can be automatically quarantined preventing the malware from spreading within the network. Customizable, on-demand analysis reports for any emulated file provide full insight and details on malicious activities, file behavior, system-registry entries, evasion and obfuscation techniques. This also enables network activities such as establishing encrypted connections to Botnet Command and Control Centers for increased security posture to evade scaled Botnet attacks. The web filtering options for the Barracuda CloudGen Firewall options enable highly granular, real-time visibility into online activity, broken down by individual users and applications, letting administrators create and enforce effective Internet content and access policies. It protects user productivity, blocks malware downloads and other web-based threats, and enables compliance by blocking access to unwanted websites and servers, providing an important additional layer of security alongside application control. Barracuda Web Filter offers online URL categorization (requires a valid Energize Updates subscription). Barracuda CloudGen Firewall provides a powerful and extremely reliable detection and classification of more than 1,400 applications and sub-applications by combining Deep Packet Inspection (DPI) and behavioral traffic analysis - no matter if the protocols are using advanced obfuscation, port hopping techniques, or encryption. It allows the creation of dynamic application policies and facilitates establishing and enforcing acceptable access and use policies for users and groups by application, application category, location, and time of day. Barracuda CloudGen Firewall combines its application control with the seamless integration of authentication schemes like Active Directory, LDAP/S, NTLM, etc. As a consequence, an administrator is always on top of what the users to on the organization's network. Barracuda CloudGen Firewall features advanced application-based routing path selection and Quality of Service (QoS) capabilities. These provide additional business value in addition to security by significantly improving network quality and availability, as well as reducing direct line cost due to bandwidth saved. For rich reporting and drill-down capabilities, Barracuda CloudGen Firewall comes with real-time and historical application visibility that shows application traffic on the corporate network, thus providing a basis for deciding which connections should be given bandwidth prioritization, crucial to QoS optimization for business-critical applications. Furthermore, it allows adjusting and refining the corporate application use policies. On top of the 1,400+ applications that are delivered out of the box and constantly updated, Barracuda CloudGen Firewall provides a way to easily create user-defined application definitions for best-in-class application control customized and tailored to an organization's specific needs. The combination of next-generation security and adaptive WAN routing allows Barracuda CloudGen Firewall to dynamically assign available bandwidth for several links not only based on protocol, user, location, and content, but also based on applications, application categories, and web filter categories. This keeps expensive, highly available lines free for business and missioncritical applications, while significantly reducing response times and freeing up additional bandwidth. In either way, collecting the traffic has no impact on the firewall performance at all. The report creation can be started manually (on-demand) or scheduled (including automated email distribution). And - of course - this report is fully customizable to comply with possible branding requirements. Today's corporate networks are being transformed by the proliferation of mobile devices and the increasing adoption of SaaS offerings like Microsoft's Office 365 and moving corporate services to private or public clouds. The net result of this is increased dispersion or fragmentation of corporate network into multiple dislocated segments and a massively increased attack surface. In this scenario a firewall solution is needed that can be deployed to multiple locations on the network with the corresponding next-generation deep inspection features to mitigate attacks. The introduction of, e.g., Office 365 all of a sudden creates a need for direct internet break outs at multiple branch office locations. Thus multiple enforcement points need to be created. Business critical internal traffic running across the WAN links must be protected against outages as well as quality of service impairments due to aggressive but less important network activities on the same physical infrastructure. Multiple Barracuda CloudGen Firewalls deployed to multiple physical and cloud locations allow an organization to span a highly performant and secure logical application delivery network (ADN) on top of the physical and virtualized infrastructure components. In conjunction with our leading central management concepts both the initial implementation and subsequent life cycle management tasks around the AND can be accomplished a surprisingly low total cost. The key feature here is that full next-gen deep inspection can be combined with smart policy based adaptive traffic management. Policy based means that applicable QoS settings (bandwidth guarantees, priorities), network path selection, e.g., MPLS vs VPN, and/or privacy requirements can be based on the application or the person/groups causing the traffic. Adaptive means that failover policies can be defined that make sure that in case of unavailability of a particular path available alternative paths can be utilized. This feature allows for improved fault tolerance against outages as well for cost optimization strategies where multiple carriers/ISPs are combined to get the required bandwidth at an optimum price point. Public cloud offerings like Amazon EC2 and Microsoft Azure are a new and increasingly attractive way to lower cost around IT operations. 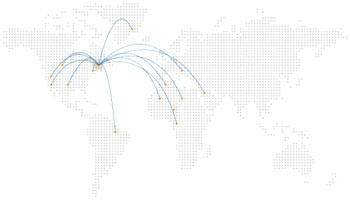 The business lines profit from a faster-timeto- market, good compute elasticity and an easy option to achieve global service availability quickly. There are challenges too. Replication typical on-premises DC concepts in these environments is impossible without a cloud compatible firewall product. The Barracuda CloudGen Firewall is ideal for securing and compartmentalizing these public cloud environments - connecting on-premises networks to the cloud and connecting logically separated components within the cloud data centers. But before an organization can benefit of the cloud, it is mandatory to get to the cloud! As mentioned earlier, Barracuda CloudGen Firewall includes information on application, application categories, as well as web filter categories into its link selection policy. Such link policies can force for instance business critical traffic to use T1 lines whereas uncritical bulk traffic is routed via less expensive lines. Limited network resources make bandwidth prioritization a necessity. Barracuda CloudGen Firewall provides strong Quality of Service (QoS) that lets the administrator apply quality aspects and service guarantees to selected traffic flows within the WAN. QoS is often used to prioritize the network traffic of applications that are critical and must not be affected by the network traffic of other applications. Barracuda CloudGen Firewall provides a large set of QoS techniques, such as traffic shaping, on-the-fly traffic prioritization, and bandwidth partitioning, which assigns a bandwidth limit to certain types of traffic. To select traffic for different priority classes, the available real-time traffic analysis can be used to identify whether network traffic was sent by business-critical applications or by potentially unwanted applications. To ensure the best and most cost-efficient connectivity, Barracuda CloudGen Firewall provides a wide range of built-in uplink options such as unlimited leased lines, up to four uplinks, etc. By eliminating the need to purchase additional devices for link balancing, security conscious customers will have access to a WAN connection that never goes down, even if one or two of the existing WAN uplinks are severed. Further, traffic intelligence mechanisms make sure the next defined uplink is activated on the fly and all traffic is rerouted to make full use of the remaining lines. In the event that backup lines provide less bandwidth, intelligent traffic shaping automatically prioritizes businesscritical applications, networks, or distinct endpoints. Simply by defining which deployments may create dynamic site-to-site VPN connections and, thereby, ensure business and communication continuity via low latency VPN connections. Barracuda CloudGen Firewall can significantly enhance the WAN performance of distributed network environments by improving availability, performance, and response time of businesscritical applications by lowering throughput and transmission delays, affecting time-sensitive decisions and enterprise profitability. The next-generation networking concept of Barracuda CloudGen Firewall provides a set of powerful features to efficiently reduce and offset the negative effects of high line latencies and response times. By implementing enterprisegrade WAN acceleration features such as data deduplication, traffic compression, and protocol optimization, Barracuda CloudGen Firewall can significantly improve site-to-site WAN traffic and increase productivity by accelerating the delivery of business applications - at no extra charge. WAN traffic can be effectively compressed up to 95 percent, significantly reducing the bandwidth needed at remote locations while increasing network responsiveness. Barracuda CloudGen Firewall incorporates advanced site-to-site and client-to-site VPN capabilities, using both SSL and IPsec protocols to ensure remote users can easily and securely access network resources without time-consuming client configuration and management. The communication protocols used with our VPN clients are optimized to be fully roaming-capable by quickly reconnecting upon loss of communication. 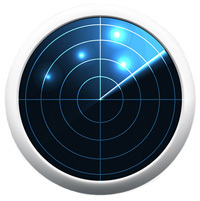 Smart pathfinder technology determines the nearest point of entry to the corporate network. Advanced NAT traversal technology can use different ports encapsulated in either TCP or UDP and, thus, is able to pass through web proxies. The influx of private computing devices, from smartphones to laptops and tablets, into the workplace may help increase productivity, flexibility, and convenience. However, BYOD adds new security challenges and risks, such as enabling and controlling access, as well as preventing data loss. Barracuda CloudGen Firewall provides strong capabilities to give users the full advantage of their devices while reducing possible risks to the business. Unwanted applications can be blocked, LAN segmentation can protect sensitive data, and network access control can check the health state of each device connecting to the corporate network. Barracuda's Mobile Portal enables you to set up shortcuts on the home-screen of devices such as smartphones or tablets. When accessing the portal via the web browser on a mobile device, users can browse apps, network folders and files as if they were connected to the office network. The Mobile Portal supports most of commonly used devices, e.g., Apple iOS, Android, and Blackberry devices and is part of the "NG SSL VPN and NAC" subscription. Every Barracuda CloudGen Firewall unit supports an unlimited number of VPN clients at no extra cost. 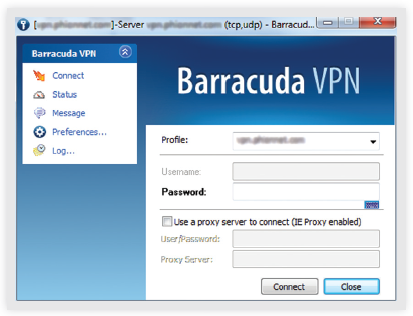 The Barracuda VPN client also provides the ability to enforce Windows Security Center settings on client machines running Windows. This allows administrators to centrally enforce the usage of Windows Security settings on PCs. The enforced policies can include enabling the Microsoft Network Firewall, Windows Updates, Windows Virus Protection, Windows Spyware Protection, and Internet Security Settings. The Barracuda Network Access Client, when used with a Barracuda NG Firewall, provides centrally managed Network Access Control (NAC) and an advanced personal firewall. This allows enforcement of minimum Windows client security prerequisites before being allowed access to the network or access to a quarantine network. Security posture can be specified according to available Windows patch level, availability of antivirus and/or anti-spyware, and user ID. Access restrictions are enforced locally on the client by the centrally managed personal Windows firewall as well as at the gateway. Using existing Barracuda NG Firewall appliances, Barracuda Networks offers a ready-to-use Network Access Control framework without expensive investments into the basic network infrastructure. All Barracuda Network Access Clients as well as all Barracuda CloudGen Firewall units acting as policy servers can be administered, monitored, and reviewed via the Barracuda NextGen Control Center. Due to the limitations that come with standard IPsec connections Barracuda Networks created several powerful extensions to standard IPsec tunnel management. This core of the Barracuda NG VPN engine is called TINA (Transport Independent Network Architecture). 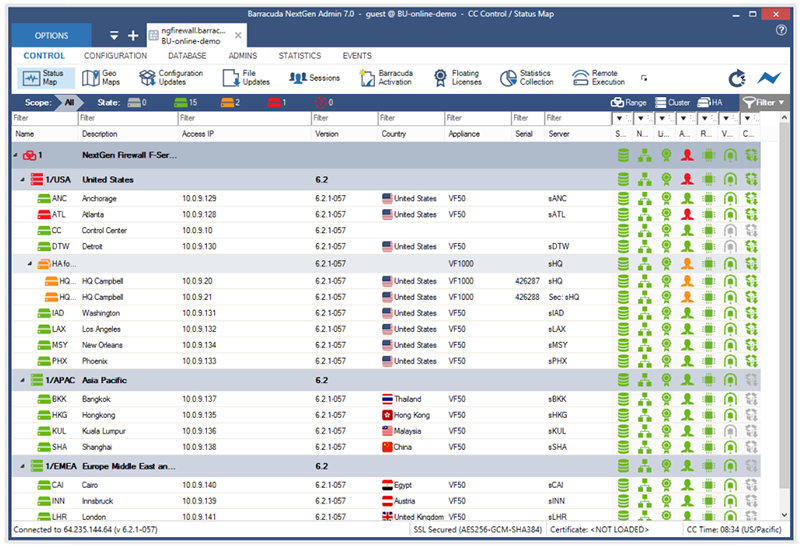 Barracuda NextGen Control Center's Status Map displays a drill down status overview of all centrally managed Barracuda CloudGen Firewall units. Managing the security issues in a widely distributed enterprise network can be painful and extremely time consuming. Managing a system may take only 15 minutes per day. But having 20 firewall systems in place results in five hours per day - just to manage the existing system. With Barracuda NextGen Control Center, managing mulitple Barracuda CloudGen Firewalls takes the same amount of time as managing one. Absent application awareness, existing Firewall and UTM solutions will generally prove ineffective at dealing with a growing category of current and emerging threats. Even when best-of-breed point solutions can be utilized to provide protection along all threat vectors, such as email, Web, remote access, and IM, operational costs can typically be reduced through consolidation. Beyond threat protection, application-awareness can dramatically improve traffic prioritization and routing decisions over site-to-site connections, resulting in cost reductions of MPLS, leased line, bandwidth, or 3G data charges associated with maintaining reliable WANs. Through the Barracuda NextGen Control Center, the Barracuda CloudGen Firewall delivers next generation firewall features with industry-leading centralized management, capable of scaling to thousands of firewalls with very little administrative overhead. The Barracuda CloudGen Firewall provides application-aware traffic management and prioritization across the WAN, featuring adaptive routing based on network traffic conditions and link status. In addition, through Barracuda NextGen Control Center, administrators can efficiently monitor VPN tunnels and firewall status. To centralize management across many different firewalls and remote access users, the Barracuda NextGen Control Center enables administrators to configure security and network access policies, control firmware update revisions, and manage user settings. Template-based configuration and globally available security objects enable efficient configuration across thousands of locations. The Barracuda NextGen Control Center supports multiple administrators simultaneously - even within the same configuration tree. Highly customizable administrative roles can be defined to delegate administrative capabilities for specific departments or locations. What are the differences in levels between the Barracuda NextGen Control Center editions? The Barracuda Networks CloudGen Firewalls include application layer proxies for HTTP, HTTPS (optional), FTP, SSH as well as a generic TCP and SOCKS proxy. 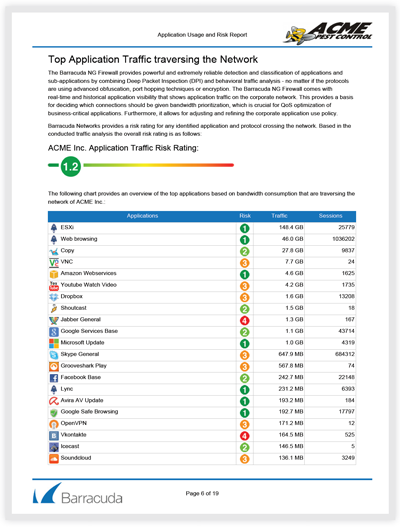 Next generation firewalls utilizing Layer 7 application profiling can identify and enforce policy on more sophisticated applications which may hide their traffic inside otherwise “safe” port/protocols such as HTTP. Skype and peer-to-peer (P2P) applications are particularly notorious for requiring Layer 7 application profiling for policy enforcement. The Barracuda CloudGen Firewall integrates Layer 7 application profiling into its core firewall functions, enabling enforcement of policy based on user ID, security policy, location, and time of day. Policy actions can include blocking, allowing, throttling, or even enabling or disabling of specific application features. 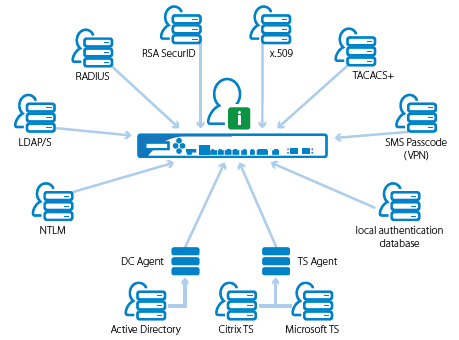 The Barracuda CloudGen Firewall can authenticate users and enforce user-aware policy using Active Directory, NTLM, MC CHAP, RADIUS, RSA SecurID, LDAP/LDAPS, TACACS+, and x.509 certificates. All Barracuda NextGen Control Center and Barracuda CloudGen Firewall appliances come with extensive network connectivity troubleshooting and visualization tools. Even for large networks it typically only takes a few mouse clicks to analyze and remediate a problem in the central audit log or access cache screen. The Barracuda CloudGen Firewall comes in seven base hardware configurations, ranging from very small office to data center locations. Entry level pricing for the Barracuda CloudGen Firewall F10 starts at $599. There is a one year warranty against manufacturing defects in the USA and Canada. When will the Barracuda CloudGen Firewall be available? The Barracuda CloudGen Firewall is available immediately for sale in North America with the ability to ship to remote customer locations across the world. Please contact your Barracuda Networks sales representative for more information.